I haven’t posted a recipe in a while, but I had to share this one because I LOVE Ice Cream. I know most diets out there don’t allow you to have ice cream on a regular basis, mostly because it is high in fat and sugar. Fear not, because I have found the recipe to help your ice cream craving. Although you may not believe me, this ice cream actually tastes really good, and just like any ice cream sundae, you can add whatever ingredients and toppings you want to make it your own. 1. Peel, cut, and freeze 2 bananas in a zip lock bag. 2. Once the bananas are frozen (at least a few hours), place the bananas in a food processor or blender. 3. Add a splash of milk. DO NOT add all of the milk at once. 4. Blend the bananas and milk, slowly adding the rest of the milk in as you continue to blend and obtain the desired consistency. 5. Add and blend 1 scoop of Chocolate Protein Powder. Mix well. 6. Scoop Ice cream out into a bowl and add any extra ingredients. I added a peanut butter drizzle and banana chips on top. 1. Chopping the bananas into smaller pieces makes the blending process a lot easier. 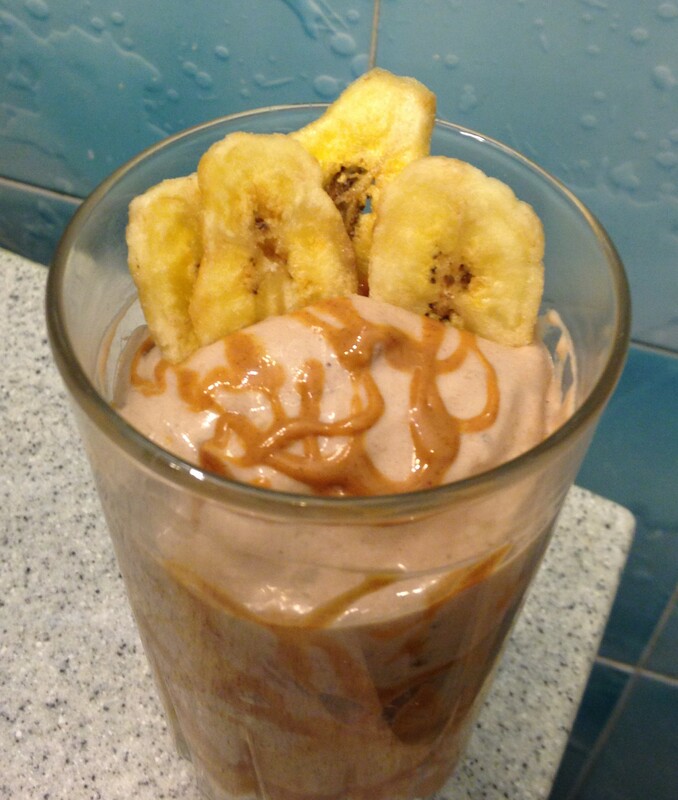 Blending a whole frozen banana can be much more of a hassle. 2. It is important to add the milk in slowly. If you put it all in at once, you can easily make a mess… Trust me. 3. The 1/4 cup of milk measure measurement is an estimate, but usually I just eyeball it. Sometimes I use more and sometimes I use less. The less milk you add, the thinker the ice cream will be. 4. You may have to use a spoon to mix the ingredients around in between blending. Because the ice cream is thick, it can stick to the side of the food processor/blender. Just push the mixture back down toward the blade while the machine is off and then blend again. 3. If you make too much, put the rest in the freezer, and enjoy it at a different time. If you save any in the freezer, however, you may need to let the ice cream thaw for a little before you get the right consistency back. 4. This recipe can be altered to make many different flavors and varieties of ice cream. Try adding different toppings like cashews or coconuts flakes, or even try adding frozen fruit into the mix or changing up the flavor protein powder that you use. BE CREATIVE!!! Do you like this recipe? 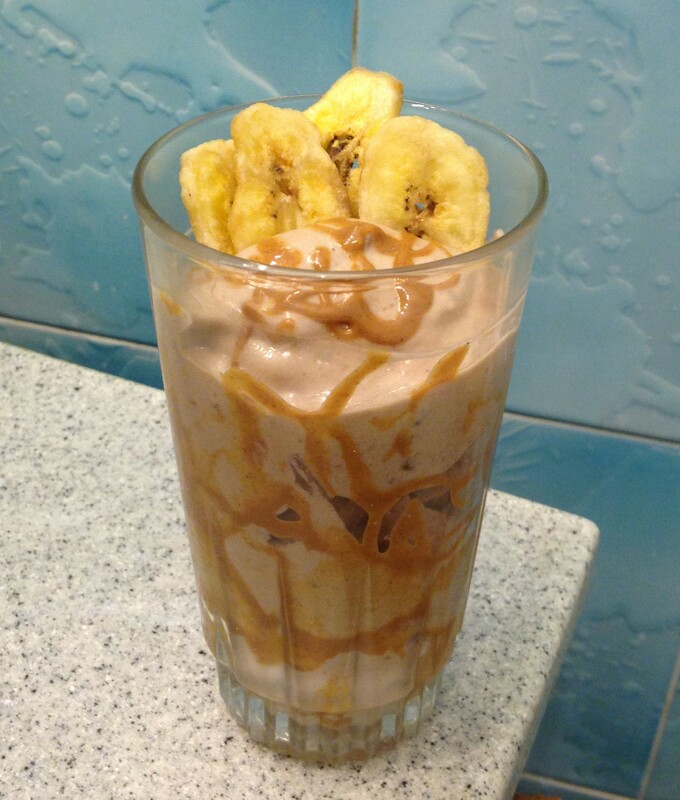 Do you have any creative ingredients you add to make your own unique Ice Cream concoction? Contact me at corestrengthalec@gmail.com with questions, comments, and ideas for new topics. Nice tips for healthy ice cream. I would definitely try this one. Keep it up! Looking forward for new recipes. I made this tonight as a treat with a gf who is into healthy eating too. Instead of protein powder we used PB2 peanut butter powder (2 tbsp = 45 calories!). It turned out fantastic…and a good way to refuel after a 10 mile run!